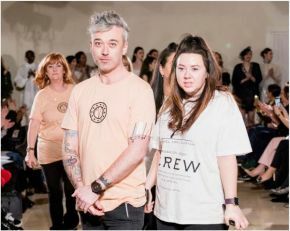 Owner of Liverpool’s AJM Hair has celebrated his first international catwalk show as Director of Hair as part of Milan Fashion Week. Hairdresser Andrew Manion was selected by designer Chanel Joan Elkayam to create a number of striking hair styles for the fashion showcase officially scheduled alongside the likes of Fendi and Prada. Having first worked with the designer at Manchester Fashion Week in 2014, Andrew was approached directly to attend the world-renowned fashion event alongside his expert team of stylists. Andrew said: “Being selected as Director of Hair for a Milan Fashion Week catwalk show has been incredibly exciting and a fantastic experience on both a professional and personal level. I was honoured to work so closely alongside designer Chanel Joan Elkayam who has become a good friend since we first met in the UK where we have since collaborated on a number of photoshoots. As a young and upcoming designer, she is incredibly creative and wanted the hair styles featured in her show to work seamlessly with the collection, telling the story of her own grandmother’s journey in war-torn Italy during the 1940s. With this in mind, we worked closely together for over six months to create four stunning hairstyles for the 30 models on the runway. Andrew Manion was accompanied on the four-day trip with his team consisting of Karen Manion, Duncan Fisher, Carrie-Anne Shirley, Karen Carberry, Mandy Knight, Anna Crilly, Gemma Redfern, Louise Quinn, Livv Mckay and Collette Knowles. The event was self-funded with sponsorship from Maria Nila Stockholm who provided hair styling products for the occasion. For more information call AJM Hair on 0151 306 6911.